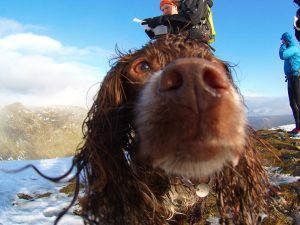 A good running mate has decided that he is to take on the challenge of the Bob Graham Round in summer 2017. For those that do not know, this is a historic fell running challenge, first completed by hotelier – Bob Graham in 1932, where by he set out to travel 66 miles including 42 peaks (Wainwrights) within 24 hours. The challenge now has summer and winter completions, clockwise and anti-clockwise route choice and a whole lot of folklore surrounding it. My mate, just fancies “having a go”. And why not! My running club, Clayton -le-Moors Harriers has a long record in fell running and ‘BG’ attempts. With several members having completed BG’s or supported BG’s there is no shortage of expertise in the route. With a small hardy group of 7 (and Rosie) we arranged to meet in Threlkeld at the “leg change over” point so we could pile in to one vehicle to drive down to Dunmail Raise to then run back to the other car. CleM run the BG anticlockwise. I don’t know why… why not? 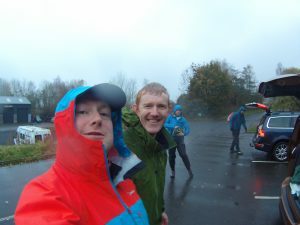 The forecast was mixed, but with all saying sub zero in the wind, wet and fog/mist for much of the day we all took the decision to set off in full waterproofs. For a fell runner – that never happens! 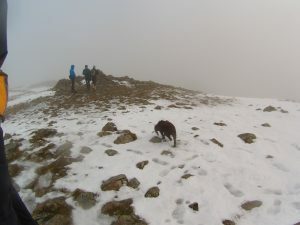 By the top of Seat Sandal, the first of our 11 “peaks” on this leg the decision was justified, with snow on the ground still and moisture pretty much everywhere, progress was steady, with time taken to view alternative lines of ascent and descent between the peaks on route. All of us are experienced runners and mountain walkers so staying fueled, hydrated and warm was easy as all of us kept tabs on each other. The youngest member of the group (aged 8 – Rosie) got extra attention, especially when the snacks were broken out! 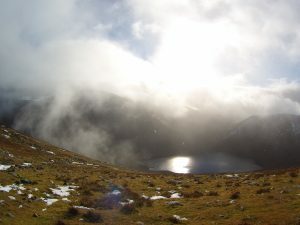 Our day – approximately 23km, with 1600m of ascent took us over Helvellyn and the Dodds, some of the Lake’s biggest mountains and a cracking days walk for anyone. We were rewarded by the fog and mist lifting briefly as we came off Fairfield toward Grisedale Tarn, before Dollywagon Pike. What a view! We made good progress and got back to the car (and near by pub) in five hours, with the weather improving all the time as soon as we got off Clough Head. My lessons learned were very much personal -I can’t imagine the time when I will be fit enough to even dream about doing my own BG! Other then that all my gear worked and I was comfortable all the way round, we didn’t need the group shelter as we didn’t stop long enough to need it. It made a pleasant change to not be focussed on the nav for this one as three of the party have done and supported multiple BG’s – their ‘local knowledge’ was astounding. Given how poor visibility was for much of the route I think I saw two bearings being taken all day! Previous Previous post: a site under construction to tell the world the fun and fulfillment that comes from exploring the UK’s wilder parts to encourage you to want to take me with you.